EXPERIENCE: A TRULY COMPLETE ATHLETIC PERFORMANCE PRE-WORKOUT SYSTEM. IT’S MORE THAN ENERGY. IT’S REAL PERFORMANCE. 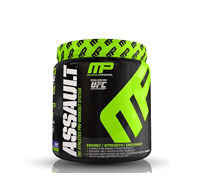 Assault’s pre-workout formulation is the most advanced and complete pre-workout system on the market. Precision-engineered to give athletes the ultimate performance advantage over the competition. Assault's 5-Stage delivery system addresses every angle of performance: Size. Energy. Focus. Strength. Endurance. Fuel your body with the most advanced ingredients so you dominate every workout and achieve maximum results. 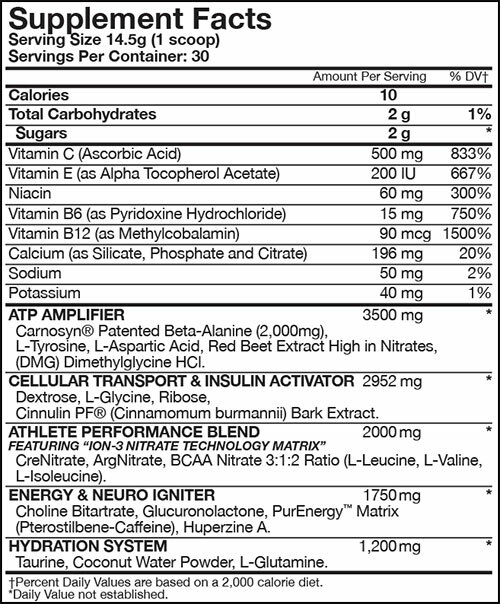 Each serving of Assault is loaded with 2 grams of patented Carnosyn® Beta-Alanine, along with ION-3 Nitrate Technology™ nutrients. Experience enhanced strength, endurance, muscle mass, and overall improved athletic training capacity. STAY FOCUSED AND BLASTING FROM THE FIRST REP TO THE VERY LAST SET. PREPARE TO ASSAULT™ THE GYM WITH OUR REVOLUTIONARY 5-STAGE DELIVERY SYSTEM! Other Ingredients: Natural & Artificial Flavors, Sucralose, Citric Acid, Red Beet Juice Powder (for color),Medium Chain Triglyceride Powder, Natural Blue Color (Fruit Juice Concentrate, Gum Arabic, Citric Acid,Tricalcium Phosphate), Acesulfame Potassium.